Hope is one of those words that can be difficult for someone to define. If you have hope, you know it. If you don’t, and are hopeless, you know that, too. But what is hope? How would you define it? More importantly, how does God define it in the Bible? Let’s take a look in Romans chapter 15. The first thing we need to realize is that Jehovah is a God of hope. He has so much hope that it is a part of His very nature. That means He is the source of all hope for His children. Biblical hope can best be defined as “a confident expectation”. God does not wish for things. No, that implies that He is uncertain of the outcome and is just “hoping it all turns out right”. No, God knows the end from the beginning. God is the God of hope precisely because He is certain of the outcome of things that have not yet happened from our perspective. So we can anchor our hope in the one who isn’t up in heaven crossing His fingers and hoping for the best. We not only have joy, but with God, we have fullness of joy! Another byproduct of the hope we have in God is peace. Even in the midst of life’s darkest hour, we can be at peace with God. We have a calm assurance that God is on our side because if He was willing to save us by His death, He will also see that work through to the end by His life, and constant intercession for us. God gave us grace to save us, but that same grace goes on to change us as well. So as we increase in peace and joy, we increase in hope. They all go together and build upon each other. So no matter what you are going through (and some of us are really going through it), even if it is the valley of the shadow of death, we need not fear, for God is with us (Psalm 23). 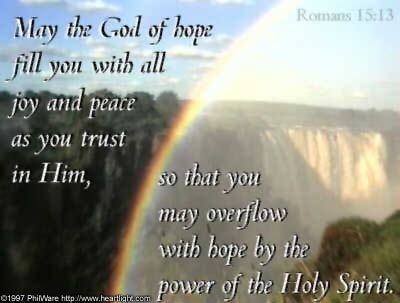 We know that we receive our hope from Him who is the very “God of hope” and can rest in His love and will for us. Have you ever struggled to do something, only to have someone else come by and do it like it was easy? It can definitely be a humbling experience. But when you have someone on your side that can handle anything that comes your way, it inspires confidence and trust in all who follow him. Jeremiah the prophet had just that sort of confidence in his God, and said so when he prayed. 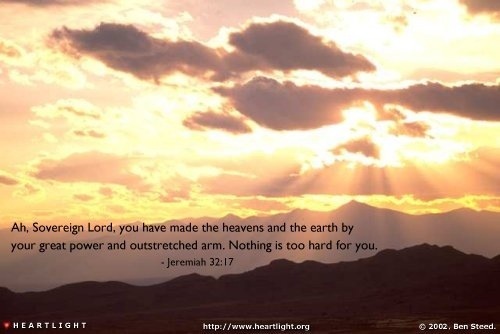 Truly, nothing is too difficult for our God. What does that mean for us as His children? There is no temptation that God cannot provide a way of escape from. No matter what our adversary throws at us, our God provides a way of escape for us. We will never encounter a situation and find that we have no choice but to sin. Of course, if we continually refuse to take those escapes, we can put ourselves into a trap. But we have to purposely refuse to escape for that to happen. There is no problem that God cannot preserve us through. The Lord’s rescues come in at least two ways. He either takes away the problem, or enables us to persevere through it. The point is, that no matter what happens, God is faithful to cause us to persevere. There is no sin that God is not willing and able to forgive. The blood that Jesus shed is of sufficient value to pay for every sin that has been or ever will be committed. The price has been paid, and we now have access to God. We have been saved to the uttermost! I am sure there is more that God can do. It would be enough if God could do all that we ask or think. But it is more than that. He can do above all we can ask or think. No, wait. It is on a higher level. He can do abundantly above all we can ask or think. Not being satisfied, Paul takes it to an exponentially greater power. God is able to do exceedingly, abundantly, above, all!